If a deer fawn is found alone in the woods, leave it there, advises a state wildlife biologist. Its mother has not abandoned it; she is probably nearby. Removing a fawn from the forest is also illegal because the animal is being taken outside the legal season for taking deer, which is the hunting season. "Many people who come upon a solitary spotted fawn in the woods or along a roadway mistakenly assume the animal has been deserted by its mother and want to take the apparently helpless creature home to care for it," said Charles Ruth, Deer/Turkey Project supervisor for the S.C. Department of Natural Resources (DNR). "Young fawns like this have not been abandoned but are still in the care of a doe." "It’s part of nature’s plan for a doe deer to leave her fawn or fawns alone for their first few weeks of life," Ruth said. "The reason for this unusual maternal action is that the fawn at this age is better protected away from the doe. The presence of the doe nearby would attract predators because the doe lacks the protective coloration of the fawn, and the older and larger doe has a much stronger odor." A fawn that appears abandoned is merely awaiting a visit from its mother, according to Ruth. A doe, after brief periods of feeding and grooming her fawn, will spend much of her day feeding and resting somewhat removed from her young. The fawn ordinarily stays bedded down as if sleeping, but will occasionally move short distances to new bedding sites. "Each spring and summer the DNR gets many calls from people who have discovered these ‘lost’ deer," Ruth said. "Young fawns are without a doubt cute and cuddly, but if taken into captivity they grow into semi-tame adult deer that can become quite dangerous." Adult buck deer, no matter how they were raised, are especially dangerous during the breeding season. Even does raised by humans are unpredictable. Occasionally "tame" deer seriously injure people, according to Ruth, and in cases where the deer are a threat to humans, the deer sometimes have to be killed. 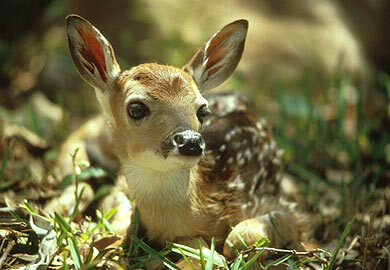 People often ask the DNR if it needs deer fawns for its research projects. Ruth said although the DNR is actively engaged in deer research, current studies do not use captive animals.